to add to the line. The update method is also updating the _xPos and _yPos constantly to make it grow. I guess what I'm really asking is is there another, more efficient way of drawing the lines, since the way I'm doing it now drops the frame rate way too much after a while (about 15-20 seconds). At this point the FPS just drops constantly until the game is unplayable. The Time Profiler tells me that this line: _lineNode.path = path is the cause of the FPS drop. Unfortunately, SKShapeNode is not that great for what you are trying to do. However, there is a way to optimize this, albeit with some caveats. First one of the largest problems with the fps is that the draw count gets extremely high because each line segment you add is another draw. If you set showsDrawCount on your SKView instance, you will see what I mean. In this answer Multiple skshapenode in one draw?, you can get more information about how you can use shouldRasterize property of a SKEffectNode to solve the problem if you are drawing something once. If you don't do this, you will have processor time spent on numerous draws each frame. So you can see that the draws is the main issue with you not getting the performance you desire. However, you seem to want to be drawing consistently over time, so what I am going to suggest might be a viable solution for you. 1 - Create a SKSpriteNode that we can use as a canvas. 2 - Create one SKShapeNode that will be used to draw ONLY the current line segment. 3 - Make that SKShapeNode a child of the canvas. 5 - Use the SKView method `textureFromNode to save what has currently been drawn on the canvas. 6 - set the texture of the canvas to that texture. Loop back to #4 and make a new path for your SKShapeNode for the next line segment. The result should be that your draw count will never be higher than 2 draws, which would solve the problem of a high draw count. Basically, you are preserving what has previously been drawn in a texture, therefore only ever needing one SKShapeNode draw for the latest line segment and one draw for the SKTexture. Again, I have not tried this process yet, and if there is any lag it would be in that textureFromNode call each frame. If anything would be your bottleneck, that would be it! // will be drawn before caching occurs. As I said, this is not all inclusive code, I assume you understand enough about the concept that you can implement into your application. These are just examples of my barebones implementation. This above it's all the code but if you want to try it, this is the link to the github repo. Reading some articles around the possibilities to improve better SKShapeNode alternatives or strong re-factoring, I've found this project called SKUShapeNode, actually incorporated in SKUtilities 2 project, an idea to make a subclass of SKSpriteNode that renders using a CAShapeLayer (some documentation), there are some bugs and there is always to convertPoint from UIKit CALayer to actual Sprite Kit using node. Not the answer you're looking for? Browse other questions tagged sprite-kit frame-rate skshapenode or ask your own question. 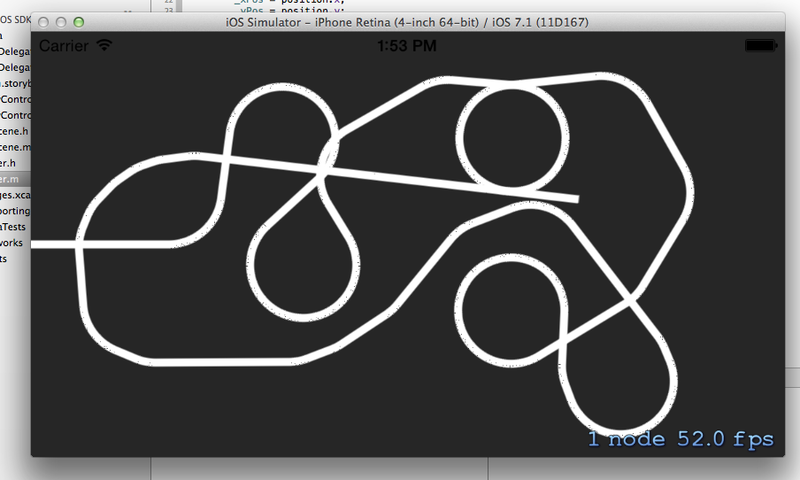 How to avoid FPS drop when drawing lines in SpriteKit? How to draw a line using SKShapeNode and make it a physics body (enable collisions)? How to modify the path of SKShapeNode on the fly?